Our weekend yoga retreat to the Oregon coast happens every year, over the first weekend of November. Join us for four deeply relaxing yoga classes, two delicious catered dinners together, the ocean right outside your door, and plenty of time to recharge. 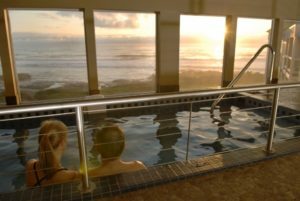 Read a book, walk on the beach, stroll into downtown Yachats for lunch or shopping, soak in the hot tub, or just stare at the ocean! Unwind and spend time with yourself and the glorious Pacific Ocean, before the holidays kick into gear. To register and save your spot, mail or drop off $195 to Sweet Yoga, 834 NE 2nd St, Corvallis OR, 97330. Deadline to register is Oct. 12th. Reserve your room separately at the Overleaf Lodge or Fireside Motel. Receive 10% off for mentioning Sweet Yoga’s retreat.